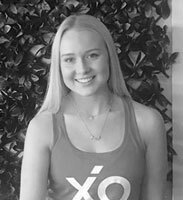 Since July 2018, Paige can be found working the front desk at Fitness XO Richmond. Having attending classes since shortly after XO first opened, Paige knows the ins and outs of the XO class types and schedules. On her days off, Paige enjoys walking around the Botanical Gardens with her two dogs. Recently completing Bachelor Of Architectural Design, Paige is about to begin her Masters studies in 2019. Let her greet you with a friendly smile as you walk in to XO – as she is super approachable and ready to assist you with any enquiries you may have!